One of the iconic images of Victoria is the much loved and well-visited Fairmont Empress Hotel, a fully restored Edwardian treasure that has seen visits from royalty, celebrities, and travellers from around the world. 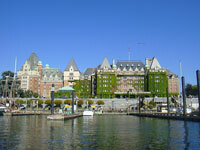 Set on the banks of Victoria's Inner Harbour, the Empress is a grand and majestic building full of stories. It retains its Britishness through its traditional afternoon tea, a popular event with tourists and locals alike which began when the hotel opened in 1908. Reservations up to a week or two in advance are essential and the dress code is smart casual. The Empress is centrally located, close to the Parliament Buildings, Royal BC Museum, the Victoria Convention Centre, and various shops and attractions. It also enjoys a golf course and spa. This 'Jewel of the Pacific' is a definite highlight of any visit to Victoria, and for those who can afford it, it is well worth a stay. Just be warned, you may receive a visit from one of the hotel ghosts.